Medicare has released advice on helping Medicare beneficiaries with their NEW I.D. cards. New Medicare cards are being issued that replace social security numbers with MBI, Medicare Beneficiary Identifiers. See Medicare's alert on keeping these numbers private and secure. Many chiropractors in Florida have received a copy of a recent report from the Office of Inspector General, U.S. Department of Health and Human Services that calls for better controls to prevent fraud, waste and abuse related to chiropractic services in Medicare. This report is based on services between 2010 and 2014 and provides us two important lessons. The FCA has received confirmation from some members that they have received letters from FCSO requesting repayments on audited claims denied by Strategic Health Solutions (SHS). There has also been at least one notice of additional payments received on codes reported as under coded. There are no reports of the repayments including an extrapolation to all payments made in 2015. The positive is that there was no extrapolation. 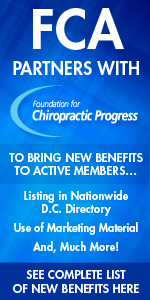 Most chiropractic physicians affected will be dealing with a couple thousand of dollars at most instead of tens or hundreds of thousands of dollars. So what should those doctors who were audited do now? Medicare is taking steps to remove Social Security numbers from Medicare cards. CMS will start mailing new cards to people with Medicare benefits in April 2018. All Medicare cards will be replaced by April 2019. Medicare is beginning the revalidation process again. If a practitioner or practice fails to respond timely to these requests they will be deactivated AND will not be able to bill Medicare or collect from the patient for services rendered while deactivated. Members are encouraged to alert their staff to look for any correspondence from Medicare or First Coast Service Options and respond urgently. Revalidations can be time consuming and frustrating. The financial impact could be significant, however, if not handled with urgency and importance. Continue reading for important links to help you revalidate with greater success.